Astronomically speaking, the spring season began last week, but in the recreational boating industry the spring selling season starts in February. This year, it did not start well. The slim sales gains that the industry achieved in January vanished the following month as a harsh and snowy winter punished the Midwest, Great Plains and Northeast states. Persistent bitterly cold weather at times reached deep into the South, pushing aside thoughts of spring and good times on the water. Statistical Surveys reported today that sales in the main powerboat segments fell 5.3 percent, or 243 boats, to 4,315, in February and they dropped 3.4 percent industrywide, or 226 boats, to 6,371, from the same month last year in 29 early reporting states that represent about 68 percent of the U.S. boating industry. Sales were lower in the main segments and industrywide for the first time since November and for only the second time since last April at the end of a three-month sales slump that was widely blamed on a cold, wet spring in many parts of the country. Just one of the high-volume categories among the main segments — aluminum fishing boats — showed a sales gain in February, and it was only 2.8 percent, or 40 boats, to 1,481. 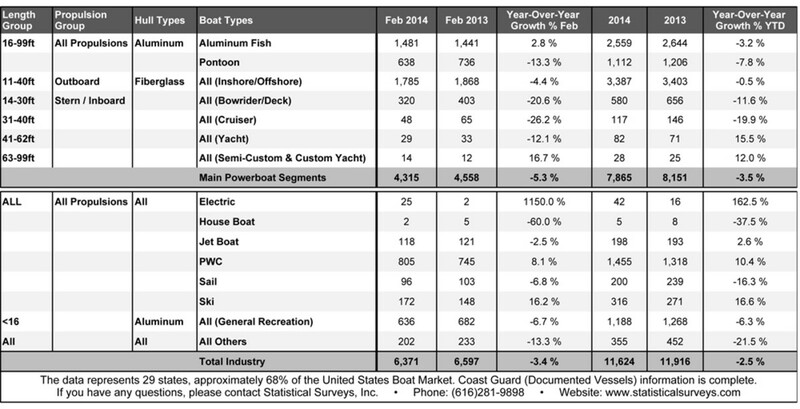 The aluminum pontoon category, a consistent leader during the industry’s recovery from the Great Recession, saw sales fall 13.3 percent, or 98 boats, to 636. Even sales of 11- to 40-foot outboard fiberglass boats struggled. The category was down 4.4 percent for the month as sales fell from 1,868 to 1,785, a drop of 83 boats. Sales of 14- to 30-foot inboard and sterndrive fiberglass boats dropped 20.6 percent, or 83, to 320. The Coast Guard was up to date in its reports of documented vessels, providing a complete picture of sales in the cruiser and yacht segments. Sales of 31- to 40-foot cruisers fell by 17, to 48, and sales of 41- to 62-foot yachts dropped by four, to 29, but sales of 63- to 99-foot custom and semicustom yachts rose by two, to 14. Interestingly, the two top-selling states among those reporting early — Florida and Texas — and eight of the top 10 reported sales that were higher than they had the previous February. Florida sold 1,451 boats, a gain of 51, and Texas sold 1,112, which was 48 more than it did in 2013. Among the top 10, only Louisiana and South Carolina reported a decline. After Florida and Texas, the February leaders, with 2013 sales in parentheses, were: Louisiana, 419 (594); Georgia, 365 (342); North Carolina, 346 (331); California, 301 (207); Arizona, 285 (250); Tennessee, 249 (219); Washington, 233 (220); and South Carolina, 204 (283). Kloppe said most of the top 10 selling states were warm-weather states. “They were still showing signs of improvement,” he said, compared with other parts of the country, where sales reflected the continuing chill. Among the other 19 early-reporting states, only three — Arizona, up 67 boats, to 124, Delaware, up 17 boats, to 117, and Alaska, up 16 boats, to 38 — reported higher sales. In Ohio, sales fell from 177 to 83. Nationally, sales of ski boats rose by 24, or 16.2 percent, to 172, and personal watercraft sales climbed by 60 units, or 8.1 percent, to 705. Sailboat sales fell by seven to 96.